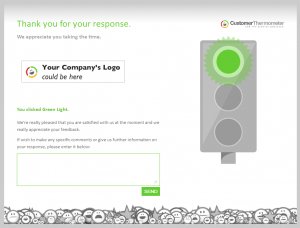 We’re excited to announce that v1.6 of Customer Thermometer has just gone live. Below, we’ve listed the new functionality that’s now available. There’s also a video demo to show you what’s new, where to find it and how to use it. Your customers can now leave you a comment along with their 1 click vote. This comment can be emailed to you immediately and/or registered alongside the customer’s vote in the reporting area. You can turn this comment box feature on by clicking the box on the “Manage Thermometers” page for each thermometer. The new functionality comment box feature will be turned off by default in your existing thermometers, so your blasts will send as normal if you don’t change anything. Click the screenshot below to view. By popular demand we have added many new icons. They range from the more corporate emoticons, through to numbers 1-4 for customers who want to poll answers to non-performance related questions. There are also new holiday icons including jack o’lanterns for Halloween, a range of gifts, snowmen and Santas for the holidays and heart icons for Valentines. In order to comply with new T&Cs for email sending, it is no longer possible to send a blast from a public email system such as gmail, hotmail, etc. If you try to send an email from one of these Customer Thermometer will automatically change the email to come from our central address feedback@customerthermometer.com which all customers are welcome to use. You can still use your public email address as normal in the “reply to” and “red/amber alerts” boxes. Any custom fields you upload with your contacts will now be displayed within reporting pages. If customers hit the wrong response in error, you can now delete their responses from the reporting area, so they results aren’t skewed. This now has its own page where you can see what subscription level you are on and upgrade or downgrade easily.